Applewald Farm is a small, family-run farm in Litchfield Maine. Tom Fair Jr. is a second- generation farmer. He and his father have been building up the farm since the early 1970’s. We farm on a site which has been farmed for over 150 years. Tom is helped in the store (an occasionally at the market) by his wife, Cynthia Turcotte who also is building up the farm’s jam and pickle business. When not working at the farm, she is an English Teacher at Wiscasset High School. Sons Isaac and Simon can also be seen lending a hand at the store or at the market. Tom’s brother Ken Fair also is quick to help out in any way he can. Farm Store- Open 7 days a week 9:00-6:00. Open July through October. *Shopping locally is good for the environment. Shipping food long distances creates extra pollution and farms preserve local greenspace. *Food is fresher and tastes better, we can tell you exactly when it was picked. *Service is friendly and knowledgeable. We have cooking tips and actually care if you are happy with our produce and service. *Shopping local helps our local economy, we are committed to shopping locally, so much of our profits go back to area businesses. We are pleased to offer a Community Supported Agriculture program. Members can choose the amount they wish to spend and can choose exactly which produce/products they would like. We keep a drawdown book for the customer to keep track of their remaining balance. Members are offered a choice of free item every time they shop, depending on what is growing well that day. 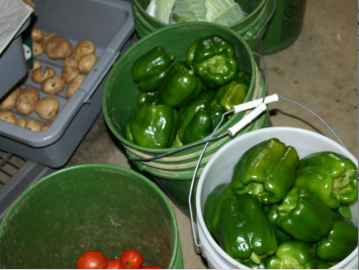 Members also get first dibs on bulk purchases for freezing or canning. Visit our farm store and pick your own apples every fall. Pick-your-own starts the second week of September and runs through the last weekend of October. The orchard is open from 9 to 6. Enjoy fresh cider, desserts, and homemade fudge in the farm store. Homemade jams pickles, and salsa are also for sale! We love families and kids- borrow a little red wagon to transport your children or apples and some pole pickers to reach the perfect apple just out of reach. Sorry, to keep the fruit as clean as possible, no dogs are allowed in the orchard. Gourds, Carrots, Herbs & more. Remember, crop success and yield for any given year are dictated by Mother Nature! Our first apples to ripen are the sour Lodi followed by the tart Jersey Macs. Regular Macintosh peak mid September. Cortlands come in at the end of September and early October. Red Delicious (excellent keepers) are ready in October. We have recently planted 150 Macoun trees, fruit to follow soon. Remember, the weather affects these dates! School tours and home-school tours are welcome, call to arrange. * Be a Maine resident. Please let us know if you or a family member is interested in signing up for the farm share program. Information is sent out and sign-up sessions are held every spring.